Where Will Lockheed Martin Be in 10 Years? Three of our experts take the long view on Lockheed Martin. Over the past decade, there are three numbers that have defined Lockheed Martin (NYSE:LMT) stock for investors: 23, 96, and 250. That's 23% revenue growth, 96% growth in profits, and, according to data from S&P Capital IQ -- a stock price that's up 250% in 10 years. 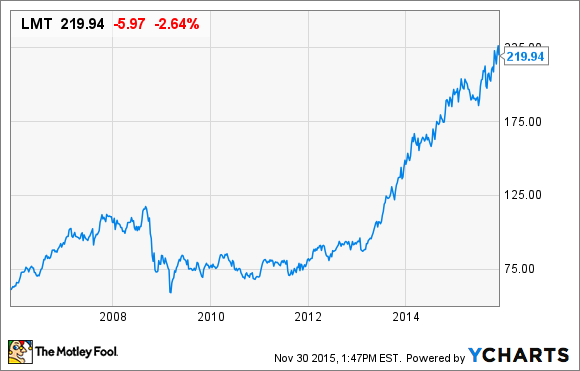 But what will the next 10 years hold for Lockheed Martin? Foretelling the future is never easy, but we've asked a few of our top analysts to take a close look at Lockheed Martin stock and give us their best guesses on where Lockheed Martin will be a decade from now. Here's what we've come up with. Lockheed Martin has often been called the world's "biggest pure-play defense contractor," and with annual revenues in excess of $45 billion -- mostly from defense businesses -- it remains so today. Whether Lockheed Martin remains the biggest and baddest defense company 10 years from now, however, requires a lot of things to go right. First and foremost, Lockheed Martin needs to work through problems with its F-35 Lightning II stealth fighter jet. It needs to build the fighters quicker, build them cheaper, and win contracts to build more of them. If it succeeds in that, then one day soon, the F-35 could account for as much as 50% of Lockheed Martin's annual sales, and at respectable profit margins. Failure, on the other hand, will put a correspondingly large chunk of Lockheed's revenues at risk. The good news for Lockheed is that the success or failure of its F-35 program is entirely within its own control. Two other risk-reward scenarios, on the other hand, may not be. Lockheed Martin's United Launch Alliance partnership with Boeing (NYSE:BA) has been put at risk by a Congressional ban on purchases of Russian RD-180 rocket motors. Without access to that engine, Lockheed and Boeing will have serious difficulties bidding on national security satellite launches for the U.S. Air Force. Separately, the USAF recently chose Northrop Grumman (NYSE:NOC) -- i.e., not Lockheed Martin and its Boeing partner -- to build a Long Range Strike Bomber that is expected to deliver tens of billions of dollars to its builder over the next few decades. Lockheed is appealing the Air Force's decision, but victory in that appeal is anything but certain. With challenges mounting in aerospace and in actual space, there's a very real risk that the world's biggest pure-play defense contractor will be a whole lot smaller in 10 years' time. Despite the continued hostility in the world with the rise of organizations such as ISIS, national defense isn't the growth industry it once was. It's not helping matters that America is growing tired of being the world's policeman, especially with running budget deficits causing mounting debt. It's a situation that's forcing defense contractors such as Lockheed Martin to shift gears a bit and focus on new frontiers for growth. One frontier that could become a much more important part of the company over the next decade is energy. Lockheed's emerging energy technologies are focused on the goal of making energy smarter, safer, and natural. To make energy smarter, Lockheed is investing in smart grid services, energy-efficiency services, and intelligent microgrid solutions, which will transform how energy is managed and consumed, to maximize its efficiency so that greenhouse-gas emissions can be reduced. To make energy safer, the company is investing in the most advanced cybersecurity so that nuclear power plants, for example, won't be susceptible to terrorist attacks. Finally, the company is focused on developing technologies to capture the natural energy of the Earth such as wave power and tidal power to harness kinetic energy under the sea. Energy security is expected to become an increasingly important component of national security. This fundamental shift will be fueled not just by booming global population growth, but also by the fact that the climate change battle is increasingly being called a national security issue. It's a fundamental shift that's poised to open up a whole new world of opportunities for Lockheed Martin in the decade ahead. Rich and Matt both make some great points, but as an income-focused investor I’d like to focus on a slightly different angle: How will Lockheed Martin’s dividend fare over the next 10 years? Over the past three decades the company has rewarded long-term income investors with some impressive, and very consistent, dividend hikes (12% CAGR). Unfortunately, there are two reasons I think investors will need to accept much slower dividend growth from now on. The largest of these is that Lockheed's dividend growth has, over the last few years, vastly outpaced its sales and free cash flow growth, which have proven anemic due to a slowdown in defense spending, which accounts for 59% of Lockheed's sales. 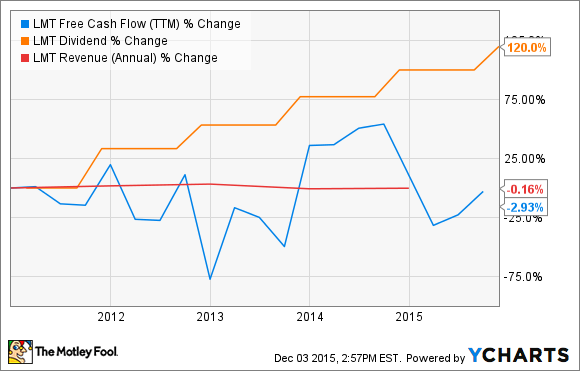 LMT Free Cash Flow (TTM) data by YCharts. These highly lucrative DOD contracts largely account for Lockheed's ability to convert an impressive 5.8% of sales into free cash flow (FCF), which is what has allowed Lockheed to reward dividend investors so generously. Data sources: 10-Q, author's calculations. In order to maintain and grow its dividend, the company needs to jump-start its FCF, which means not only growing sales but also maintaining its strong margins as well. As Matt pointed out, Lockheed has some strong growth opportunities in energy and cybersecurity that could diversify its cash flow away from traditional military hardware. However, those businesses are part of its Information Systems and Global Solutions division, which is the company's least profitable business unit. In addition, its space systems division faces potential margin pressure from Elon Musk's SpaceX, which is gunning to undercut Lockheed's 50%-owned United Launch Alliance -- which generated 27% of this business unit's operating profits -- for the Air Force's satellite-launching needs. Finally, as Rich pointed out, the long-suffering F-35 program is a huge potential opportunity, but its numerous problems, as well as future potential DOD spending cuts -- due to concerns over America's massive budget deficit -- also mean that a paring-back of that program could put a huge dent in Lockheed's sales and FCF. Meanwhile, since 2010, Lockheed's FCF payout ratio has doubled from 36% to 72%, meaning that soon the company will likely have to slow the pace of future hikes to match those of its FCF, which has become anemic, to say the least. And there you have it, folks. We promised you three thoughts on what the future holds for Lockheed Martin, and I think we've delivered on that promise. But don't just take our word(s) for it. Dozens of investors have much, much more to say on the subject of Lockheed Martin, and you can ask them about it, day or night, on our Motley Fool discussion boards. Before making any decision to buy or sell Lockheed Martin stock, you owe it to yourself to drop by the boards first. Ask about any questions that occur to you -- we're here to help.